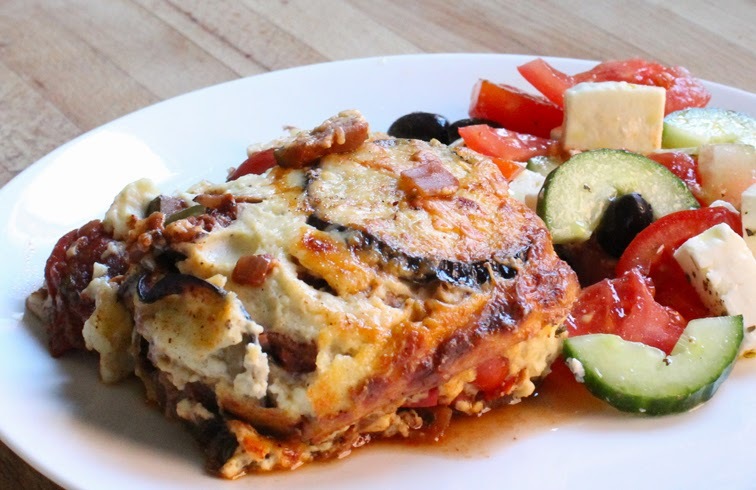 As we all know the popular Greek dish moussaka traditionally uses lamb, but as it's the start of National Vegetarian week I thought I'd give moussaka a go using just vegetables. Let me tell you it was truly delicious and every bit as tasty. To make slicing, peeling, chopping and measuring easier OXO Good Grips kindly sent me a lovely range of tools for the job. 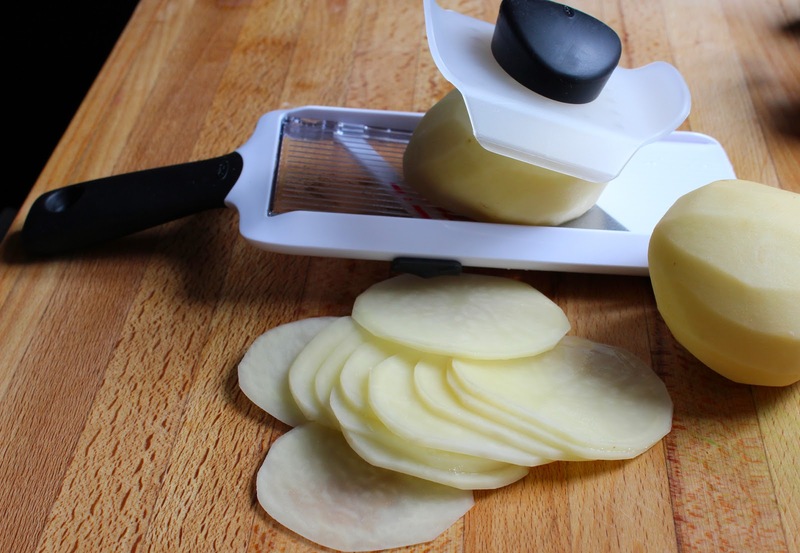 First up this rather useful hand-held mandolin slicer enabled slicing potatoes into even slices a doddle. The hand-head mandolin is easily adjusted by a simple slider on the side so you have a choice of three different thicknesses from approx 1mm to 5mm. One thing I will say is personally I would have liked the slicer to have one more thicker setting than the max it has of about 5mm. After use the blade is set to the lock position making it safe to store with the guard in place. Next up, the Herb Mincer - a fantastic little gadget. The top opens up to allow easy cleaning and it can go into the dishwasher if you wish. 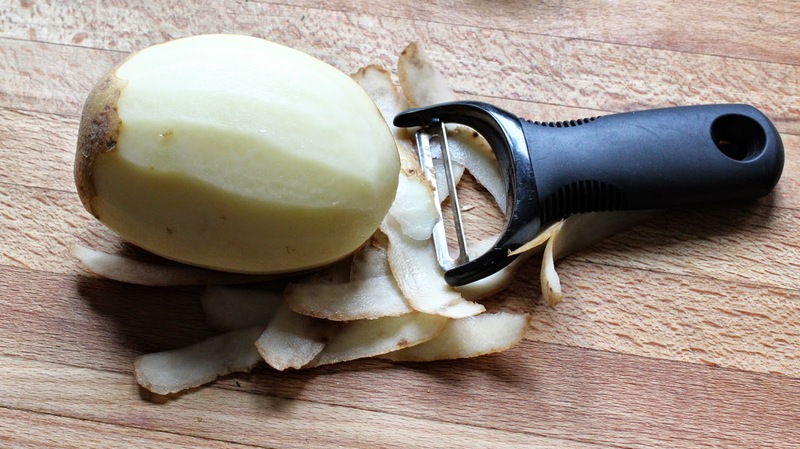 Safe to use since your fingers aren't near the blade when using. 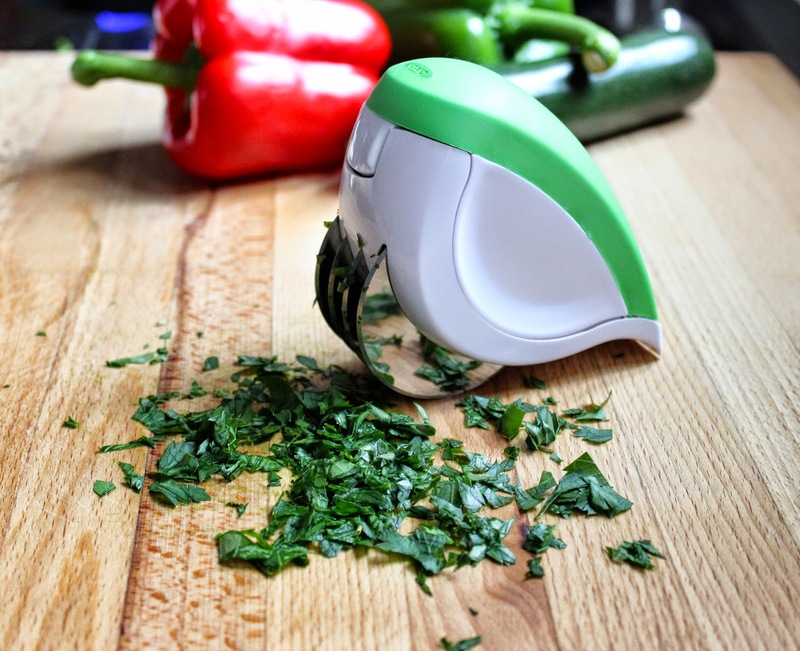 It chops herbs in seconds just by rolling back and forth and comes with a blade guard for safety when storing. 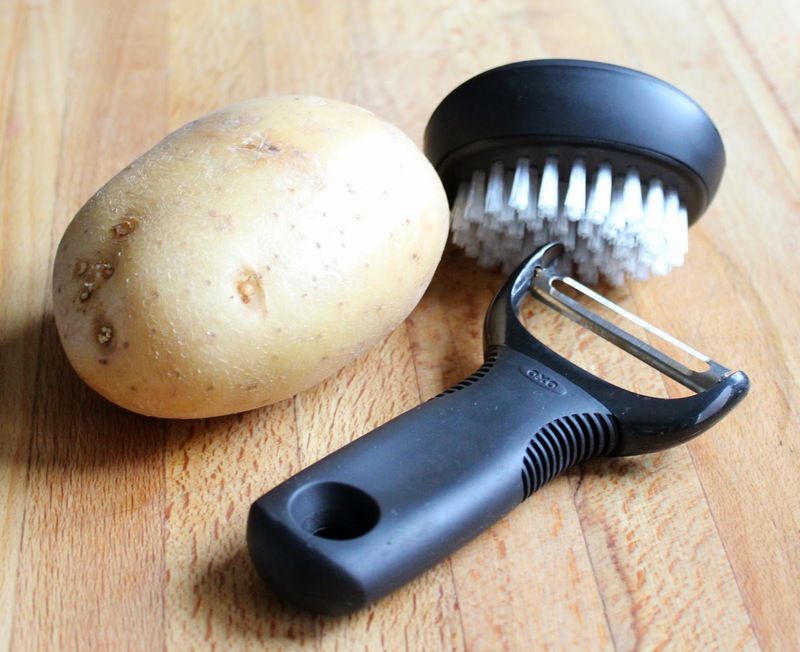 Scrubbing vegetables is once again made easy with this comfortable to hold Vegetable Brush - I didn't need to scrub my potatoes as I was about to peel them for this recipe. How many times have you gone to measure out a teaspoons of spice from a jar to find your measuring spoon will not fit the jar? 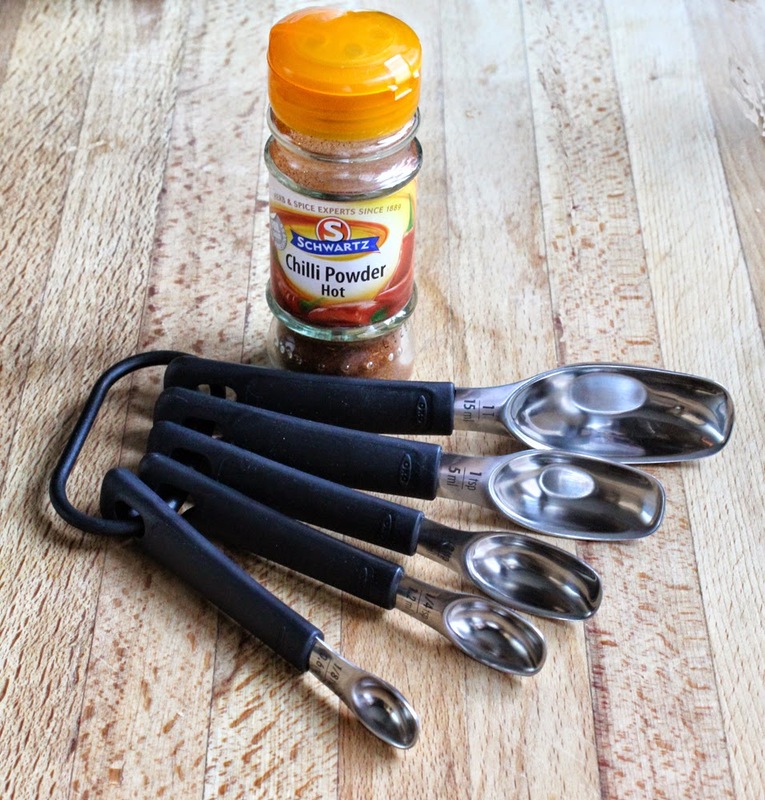 These slim measuring spoons are brilliant and the teaspoon easily fits into these slim spice jars that many of us I'm sure have in our cupboards. All in all each of these products are of good quality as always from OXO Good Grips and you can find out more over at the OXO Good Grips website. All products shown above are dishwasher safe. I bet you don't miss the lamb is this! Heat the oil in a large frying pan over a medium heat. Add the onion and garlic and cook, stirring, for 5 minutes, until soft. Increase the heat, add the courgettes and red peppers. Add the purée and cinnamon and cook, stirring, for 1 minute. Add the tomatoes and red wine. Add the oregano, season, and bring to the boil. Reduce the heat and simmer, stirring occasionally, for 20 minutes. Meanwhile, preheat the grill to medium-high. 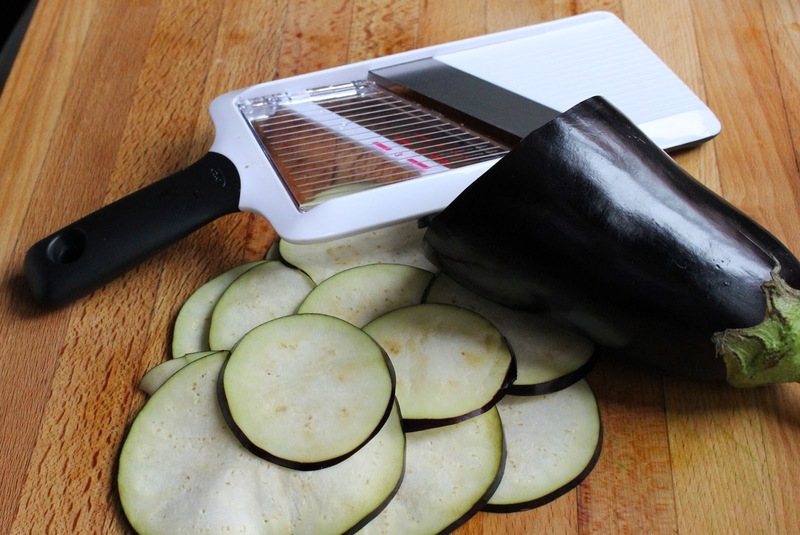 Cut each aubergine diagonally into 5mm-thick slices. Brush with oil, put half on a baking sheet and grill for 5 minutes, turning halfway, until pale golden. Drain on kitchen paper while grilling the remainder. Preheat the oven to 200C/fan180C/gas 6. Spread half the vegetable mixture in a deep, 1.2-litre ovenproof dish. Overlap with half the aubergine and the rest of the vegetables. Top with rest of the aubergine. In saucepan melt the butter over medium-low heat and stir in the flour with a wooden spoon and cook the mixture for a couple of minutes and add the salt. Now at this point, take it off the heat and add the hot milk whilst using a balloon whisk. Have a taste and add a little more salt if you think it needs it. Let it cool a bit and then add eggs and, grated cheese and keep whisking until it turns into this lovely smooth sauce. *If you don't let it cool a bit before doing this the eggs will scramble. Mix in the ground nutmeg. Pour the sauce over the top and sprinkle with a little more cheese. Top with a little sprinkling of nutmeg. Bake in a Preheated oven at 175C / 350F Gas 4 for about 40 minutes until the top is golden brown and it is hot piping hot in the middle. Disclaimer: All thoughts and opinions are my own and I was not required to write anything positive. The hand-held mandolin looks like a wining gadget - have always been a bit scared of them but I like the finger guard. Lovely recipe, too. 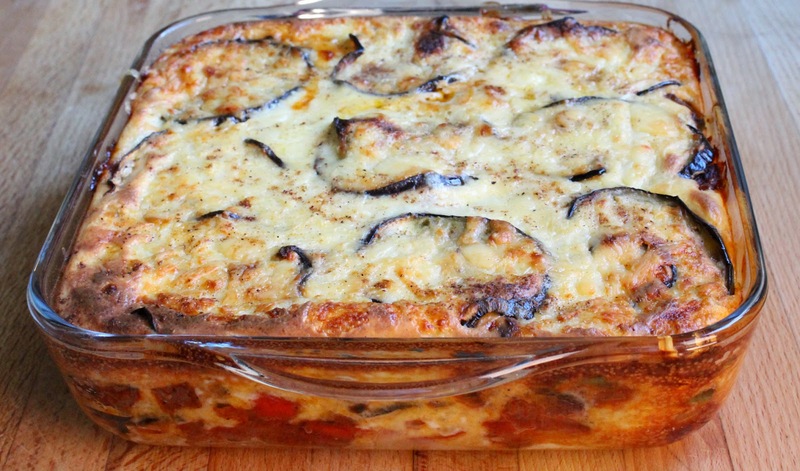 Veggie moussaka is often equally as good as the meat version as the veggies make so much flavour and the topping is always the best bit for me!